The 20th Kimono Day was held on the 11th of March, the one year anniversary of the devastating earthquakes and tsunami that rocked Japan, taking so many lives, destroying towns and leaving many more people left with nothing trying to rebuild their lives. I remember all too clearly being glued in front of the television watching in utter shock, worried about all my friends in Japan, and crying at the loss. Many of us rallied around to help in some small way – I and a few other kimono people auctioned off some of our favourite ensembles or pieces to donate towards relief efforts, some people flew to Japan to help clean up and rebuild in towns that were affected, – the whole world reached out and gave a helping hand in what ever way they could. Japantown was holding a number of different events and memorials for the day, and Kimono Day was being held in memory of the earthquakes and tsunami. Originally, I felt maybe I should go in something more sombre…but after thinking about it, while I certainly wanted to remember those who lost their lives, I felt wearing something vibrant to celebrate early Spring would be more appropriate as early Spring is a time of rebirth and growth after Winter laying waste to the land. While I know rebuilding towns and lives will take many years and the scars will never truly fade, I wanted to express my wish for rebirth. 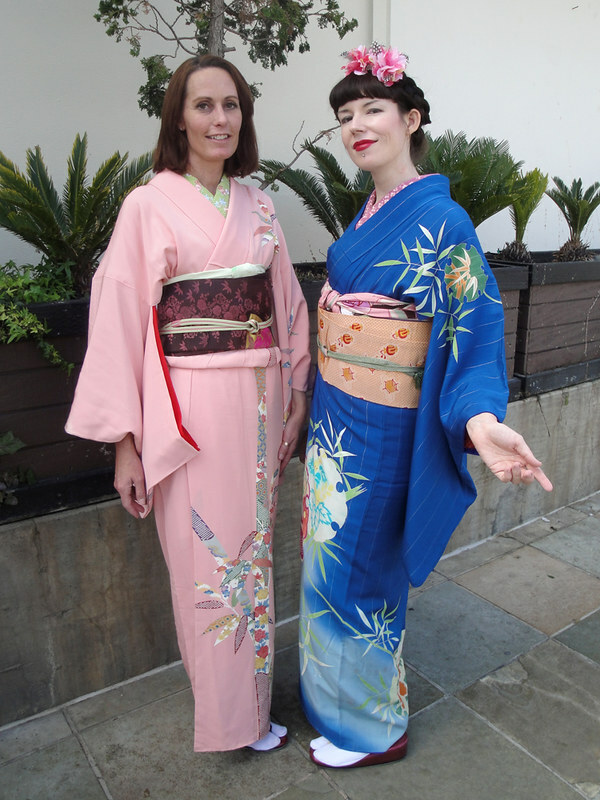 For this Kimono Day, it was just Rebecca and I. 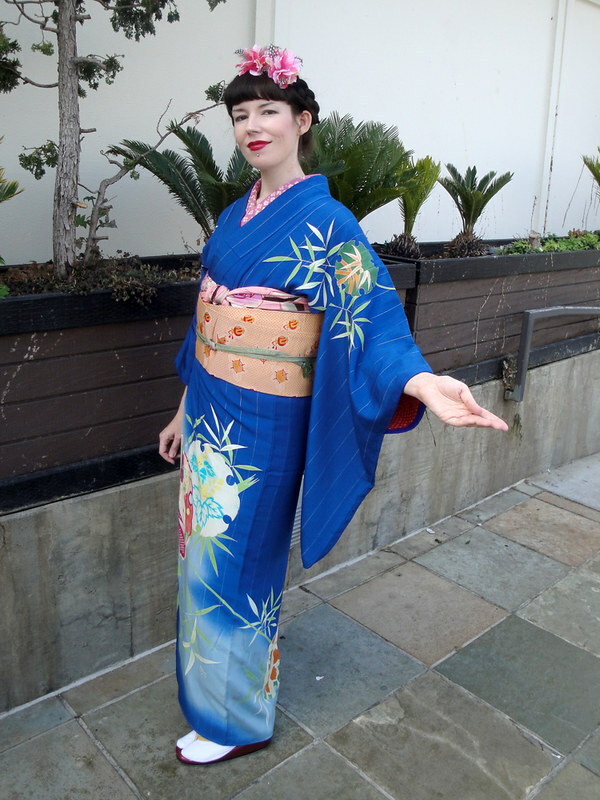 Unfortunately for me, Daylight Savings tripped me up, and caused us to run late and our time at Kimono Day was significantly shorter than I’d liked for it to have been. However, we did manage to spend a little bit of time there. Because of running late, we didn’t have a chance to get many photos this time. My ensemble consisted of a Taishō era hōmongi, that technically spans into the “”all season”” territory, however the young bamboo leaves and ice/snow crystals make me think of early Spring. I paired it with an obi that has takara (auspicious treasures), my Taishō era obiage (I felt the colours popped lovely against the blue), and a dusty pink han’eri with sakura in full bloom, as a nod to the upcoming sakura season. Rebecca wore the same hōmongi that I wore for Hinamatsuri, however, we paired it with a gorgeous rich chocolate brown obi and beautiful Spring green accessories. 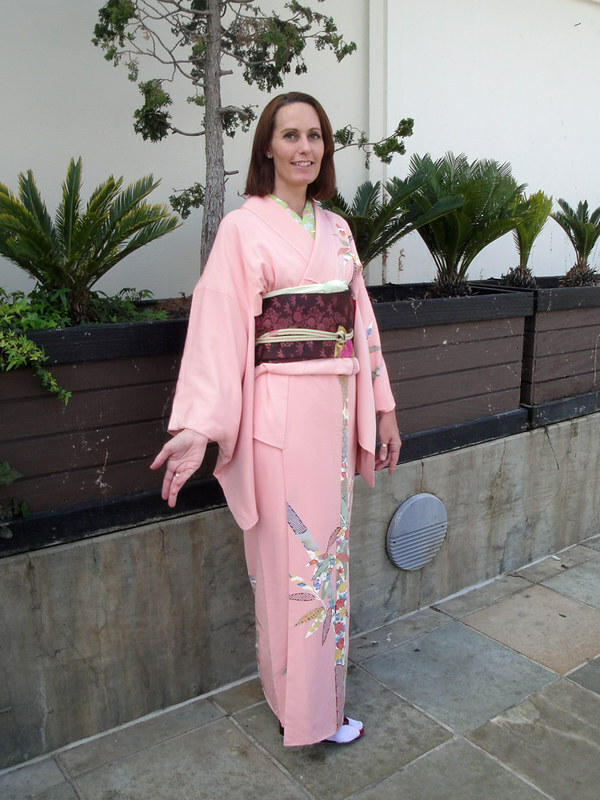 Pregnant Kitsuke – 27 Weeks Pregnant!